Turn to The Last Word, where software professionals who care about quality give you their opinions on hot topics. This month, Johanna Rothman explains what technicians can do to convince management that context switching in the technical world is a sure-fire means to a late project. Every manager has a story to tell. Find out how one management professional tackles a fictional dilemma. The story may be made up, but the solutions are tried and true. In this installment, Patrick Bailey tells the harrowing tale of a skilled technician-turned-manager who finds himself in a sticky situation with his CEO. What do you do when assigned the role of project customer, with a team that has never worked with a customer, building an application that was barely thought out? Sound like a nightmare? It doesn't have to be. Find out how one project manager beat the odds to produce a high-quality, on-time release. We're pleased to bring you technical editors who are well respected in their fields. Get their take on everything that relates to the industry, technically speaking. In this issue, Brian Marick suggests three ways to combat recidivism on your projects. Typical metrics are used to predict an outcome by comparing plans to actual results. They are objective and don't influence what you are trying to measure. Biased metrics, on the other hand, are a valuable tool for deliberately altering behavior to improve the performance of a group. Find out how biased metrics can be used on your projects to pinpoint problems in specific areas and to influence people to fix them. What does dental floss have to do with automated functional testing? More than you might think. 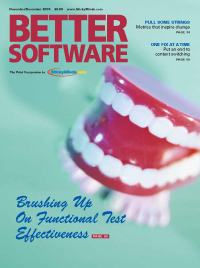 Learn from one Agile practitioner how you can apply the tenets of good oral hygiene to your functional tests for requirements artifacts so effective they'll make you smile. All code is not created equal. Learn from a master of the craft how to spot bad code and mold it into good. Mike wraps up his year-long column with tips for heading off code bankruptcy and leaves us with some final words of wisdom to help us continue to improve our coding craft. Connect with an expert to learn how to work smarter and discover new ways to uncover more defects. In this issue, Michael Bolton continues his discussion of James Bach's Heuristic Test Strategy Model by focusing on the importance of customer-facing quality criteria.